We can’t count how many times we immediately think of a table cloth at an Italian restaurant or an apron when we see gingham prints. But lately, we have decided that no print should be left out when it comes to fashion. 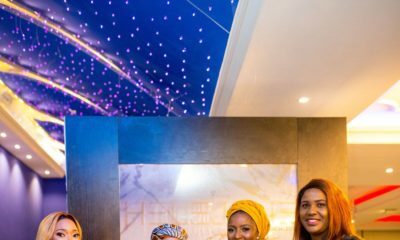 From keeping it low key with small doses, to going all out with a pretty gingham print dress, there are many ways to rock this print without looking…well…like you’re going for a picnic at Millennium park, Abuja. 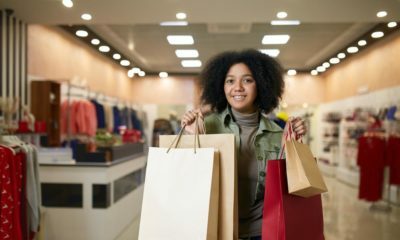 So, with this in mind, allow BN Style let you in on some great tips that can help you not only wear but style the gingham print to runway perfection. 1. The Gingham print comes in two major sizes; small and big. With the small print, it is much easier to pull of the print. From afar it blends in and just look s like a regular grid pattern and it’s only when you move closer than people realize you’re wearing a gingham print. However, with the larger print, it won’t be that easy. So how do you wear it? By adding a solid colour. The gingham print can come in any two colours, so adding a third solid colour will not only add some points to your style-o-meter but balance out your outfit well. 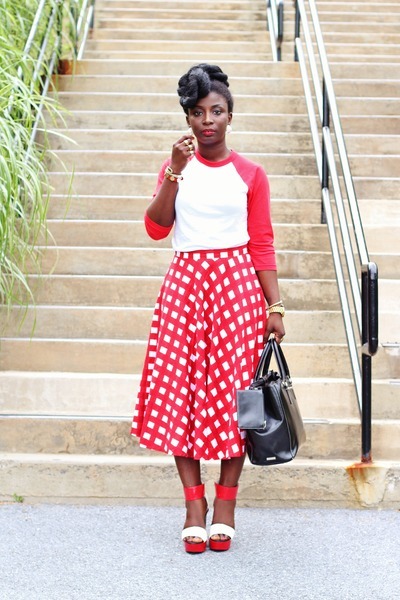 This Fashberries blogger from New York paired her ASOS Red & white Gingham skirt with an American baseball shirt. One half of the Stylish duo ourmode.ca, Elijah Gwayumba rocks his gingham print shirt under a navy blue cardigan. 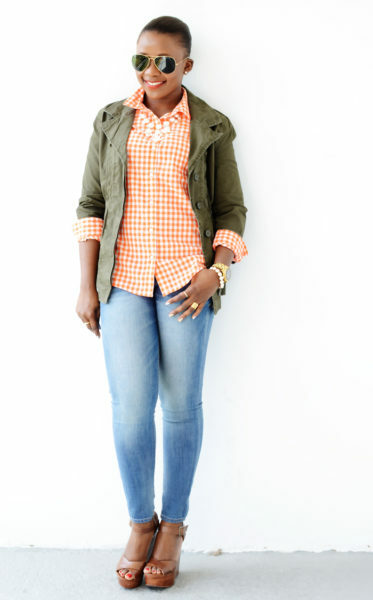 Pinksole blogger Rachelle, took the military approach and paired her gingham shirt with a military inspired jacket. 2. When wearing a vintage style gingham print, it is important that you add some modern and stylish accessories to give it a fresh vibe. The more modern it looks, the more your chances of having pulled off this look successfully. 3. If you can go double denim, why not double gingham right? A great trick to keep in your pocket is to try pairing two different sizes. This can go a number of ways. If you would like to accentuate your bottom half, then you can wear the larger sized gingham print at the bottom and pair it with a smaller sized print at the top. If you would instead like to look all together smaller, try wearing the smaller check size at the top and bottom. You can also wear a gingham top or bottom with two sizes of the gingham checks. The variation would give it a chic and trendy look that is both modern and fab. Ashleigh Hutchinson from the Thedaileigh.com is great when it comes to mixing patterns. Love this. P.S: A tailored pair of gingham print trousers or skirt makes the look very polished and neat. 4. If you’re not too sure about the gingham trend, you can try small pieces instead. For example you could wear cute gingham print shoes, a slim gingham print belt to add some texture to your outfit, a gingham print purse…the list is endless. This way you try out the trend and figure out if this is something you would like to try in bigger proportions. Stella Uzo of Jadore fashion is rocking the Miu Miu gingham shoes paired with a tailored striped suit. 5. 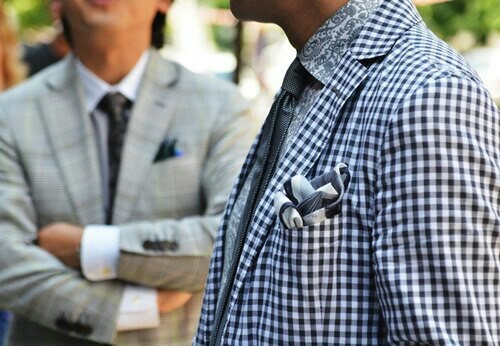 The gingham print usually comes in two colours; white and a different colour. Mix it up a bit by picking a gingham print that comes coupled with something other than white. This way the pint comes off as more stylish, bright and an exception from what others wear. Ashleigh from Thedaileigh.com shows this with a green & white gingham shirt and a neon green skirt. 6. You can pair your gingham print with a similar print. If you’re really adventurous you can go ahead and pair your print with any colour and print. However, for those that would rather play it low key, similar prints and same colurs are a safe haven. Fabulous Thedaileigh.com blogger paired her pink gingham print shirt with a striped pink and black skirt. Marsha Campbell, a fabulous style blogger from London shows us a great way to do this with statement jewelery, a fab white clutch and a fierce fur coat. Here is some great style inspiration for the fellas. paisley print shirt with a gingham blazer.Both in dark tones, all dapper. 7. Don’t be shy to try your gingham print piece in a different material. Chiffon, silk, cotton are great ways to still rock the trend but spice it up too. Have more tips on how to rock the gingham print? Share them. We would love to hear all your great ideas on how to style the gingham trend. That being said, can’t say I’m won over by this trend except in the one instance that it’s been applied to shoes. Yeah, i second that , like it more on the shoes. I think i’ve seen more gingham to last me a lifetime asper house wear in boarding school and the time when the gingham material was used as a curtain in the kitchen. Amen to you sister!!! After all those years of torture with boarding school day wear, please I will pass of the checkered (gingham) prints! Lol! 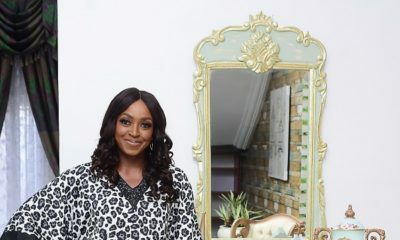 Your comment reminds me of the new rage in prints – Ghana must go Print- and wearing it just because the tag says Celine! looooool! Chai! my dear I was saying all the while no be check be this? ahh, let me go fish out my day wears from school and rerock! @ccc i bet you attended cornelia connely college,Uyo.